The Farmington, MO-based Debtor is represented by Carmody MacDonald P.C. Among others, creditors include: Accel Capital LLC, American Express, Argus Capital Funding, LLC, Capital One, Chase and Wells Fargo Bank. 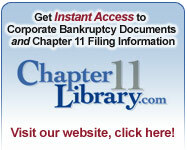 Our Chapter 11 list is your best source for Debtor and Creditor information. Sign up for a trial now! Debtor Name: Ferrous Miner Holdings, Ltd. The Petition lists the largest unsecured creditor as Verizon New England Inc. with an approximate $35.7 judgment claim. Tags: Ferrous Miner Holdings, Ltd. Debtor Name: Global Rock Networks, Inc. The New York City-based telecommunications company is represented by DelBello Donnellan Weingarten Wise & Wiederkehr, LLP. Tags: Global Rock Networks, Inc. Debtor Name: Bay Country Communications, Inc. The Cambridge, Maryland-based Debtor is represented by Cole, Schotz, Meisel, Forman & Leonard, P.A. The largest unsecured creditor is listed as Bank of Commerce with an approximate $3.1 million claim. Tags: Bay Country Communications, Inc.